2019 PROSE Award Finalist in the Media & Cultural Studies category! The rapid and ongoing evolution of digital technologies has transformed the waythe world communicates and digests information. Fueled by a 24-hour news cycleand post-truth politics, media consumption and the technologies that drive ithave become more influential in shaping public opinion, and it has become more imperative than ever to examine their social and ethical consequences. 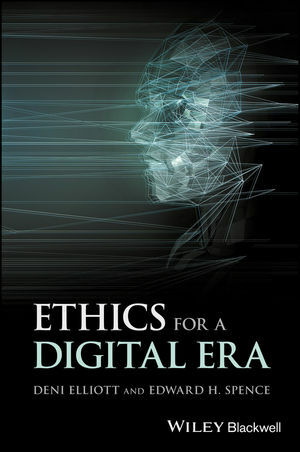 Ethics for a Digital Era provides a penetrating analysis of the ethical issues that have emerged as the digital revolution progresses, including journalistic practices that impact on the truth, reliability, and trustworthiness of communicating information. The volume explores new methods and models for ethical inquiry in a digital world, and maps out guidelines for web-based news producers and users to conceptualize ethical issuesand analyze ethically questionable acts. In each of three thematic sections, Deni Elliott and Edward H. Spence reflect upon shifts in media ethics as contemporary mass communication combines traditional analog practices with new forms like blogs, vlogs, podcasts, and social media posts, and evolves into an interactive medium with users who both produce and consume the news. Later chapters apply a process of normative decision-making to some of the most important issues which arise in these interactions, and encourage users to bridge their own thinking between the virtual and physical worlds of information and its communication. Timely and thought-provoking, Ethics for a Digital Era is an invaluable resource for undergraduate and graduate students in media and mass communication, applied ethics, and journalism, as well as general readers interested in the ethical impact of their media consumption. DENI ELLIOTT, EdD holds the Poynter Jamison Chair in Media Ethics and Press Policy and is Department Chair and full professor in the Department of Journalism and Digital Communication at the University of South Florida, St. Petersburg. EDWARD H. SPENCE teaches and conducts research in the philosophy and ethics of information technologies and communication at Charles Sturt University. He is a Research Fellow at the 4TU Centre of Excellence for Ethics and Technology in The Hague, and Research Associate at the University of Sydney, Australia.